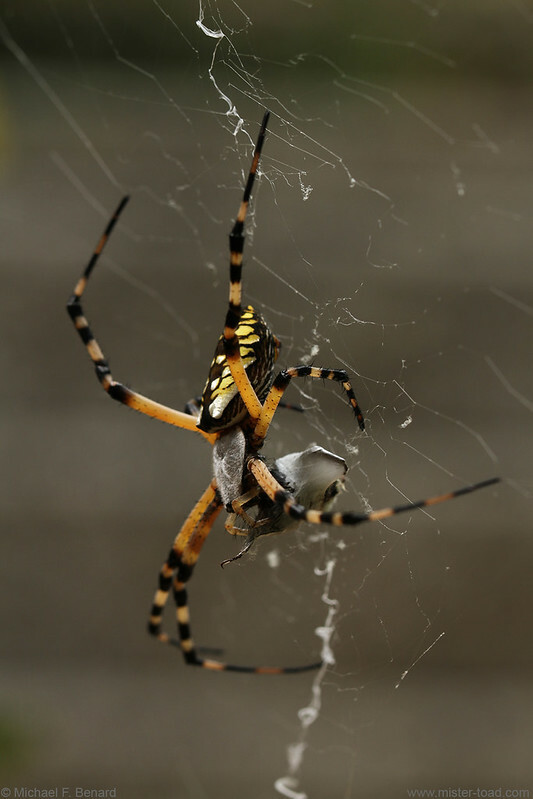 Earlier this summer, I was able to observe a yellow garden spider (Argiope aurantia) that built its web next to my parents’ front door. I noticed that it displayed a peculiar behavior in each of several heavy rainstorms. Instead of fleeing its web when the big raindrops started to pour down, the spider stayed near the center of its web. It let go of the web with its front legs, but continue to hold with its hind legs. This peculiar behavior resulted in the spider hanging perpendicular to the ground. I watched the spider do this through several heavy rainstorms, so it wasn’t just a one-time fluke. Such a distinct behavior may be an adaptation to deal with the rain. For example, perhaps this behavior reduces the amount of the spider’s body vulnerable to hits from raindrops. If it reduces hits from raindrops, the spider may be less likely to be injured or knocked from its web. And here is a photo of the spider in a heavy rain, with its body oriented perpendicular to the ground. 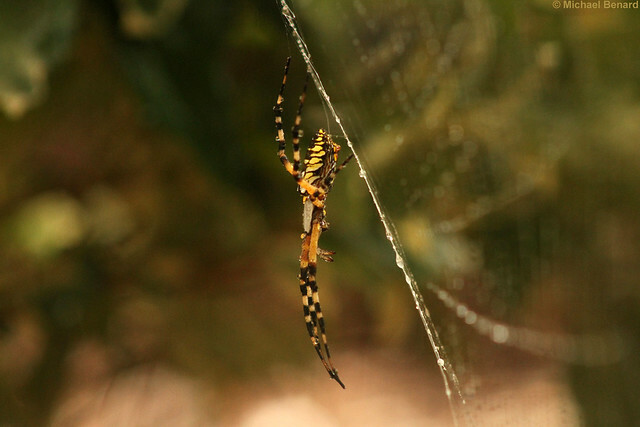 From our observations on Argiope argentata in Panama, we know that some spiders may adopt special rainfall postures if they remain in their webs and do not seek shelter under nearby vegetation. 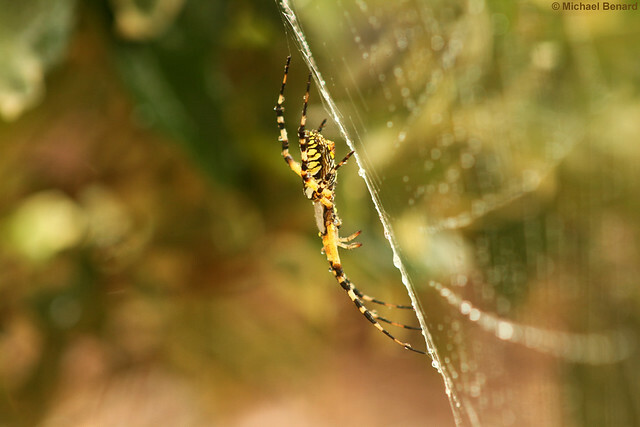 Thus Argiope argentata hangs away from its sloping web so that the body is almost perpendicular and legs I and II, which are always directed anteriorly, are off the web. In the rainfall posture these two pairs of legs are held outstretched in line with the midlateral plane of the body and at a fairly acute angel to the long axis, i.e., they are held more anteriorly than in the normal resting attitude. This position could be interpreted as minimizing the cross-sectional area exposed to the rain – assuming that tropical rains fall more-or-less vertically – or that the spider in this position maximizes the flow of water off its body surface with the anterior appendages forming a sort of drip-tip. We have since seen this behavior in Nephilia clavipes, and Leucauge species. This entry was posted in Natural History, Photography, Video and tagged behavior, Invertebrate, Natural History, Predation, spider, video. Bookmark the permalink.